Bletchenden, alias Cruttenden, was part of the possessions of the Culpepers of Aylesford. Peter Culpeper8a (the great-great-grandson of Sir Thomas Culpeper3, a direct ancestor of the modern-day Culpeppers) became the owner in 1411, and it continued in the family down to Sir Thomas Culpeper16a, 3rd Baronet, who died childless in 1723. It then passed to his sister Alicia Culpeper16a, who had four husbands. The third was Thomas Culpeper, Esq., of Hollingbourne, and the last was John Milner, M.D., of Maidstone, to whom Bletchenden passed. Photograph by Warren Culpepper, March 2000. Location: 1 mile S of Headcorn, 0.3 mile west of the A274. A mile west of the village and just north of the river (Beault) lies Summerhill. This and Kelsham adjoining were originally one estate and belonged to the Culpeper family (probably as part of Moatenden). 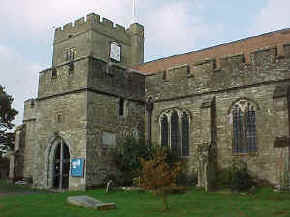 It is said that the Bethersden marble used for the greater part of the church was quarried on this estate. Locations: 1 mile W of Headcorn on Moat / Summerhill Road. A mile west of the village and just north of the river (Beault) lies Kelsham. This and Summerhill adjoining were originally one estate and belonged to the Culpeper family (probably as part of Moatenden). 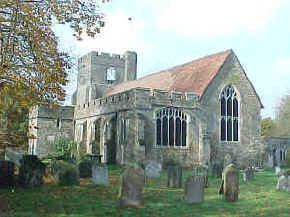 It is said that the Bethersden marble used for the greater part of the church was quarried on this estate. Photograph retrieved 27 May 2011 from Primelocation.com, a real estate website. Thanks to Carla Groen of the Netherlands for pointing out this picture. 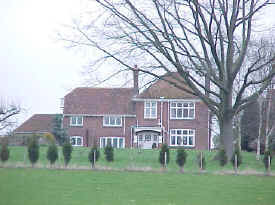 The house was identified as being on Four Oaks Road, has 8 bedrooms, 6 reception rooms and 6 baths. Asking price of £1,850,000. then S at Dray Corner. Moatenden (Mottenden) was originally a house of Trinitarian or Crutched Friars founded in 1224. In 1548, Walter Hendley conveyed it to his son-in-law Sir Thomas Culpeper10 of Bedgebury, and he in 1550 passed it to his son-in-law, Christopher Sackville, Esq. Source: Hasted, History of Kent, Vol. V, pages 326-329. Photograph provided 9 Apr 2012 by Jenny Spence. 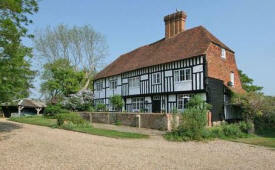 Location: 1.5 miles N of Headcorn, 0.1 miles W of the A274. Founded by John Kent in 1466. In 1538 the chantry was suppressed by Henry VIII and in 1546 was given to Sir Anthony St. Leger to hold in capite in knight’s service. 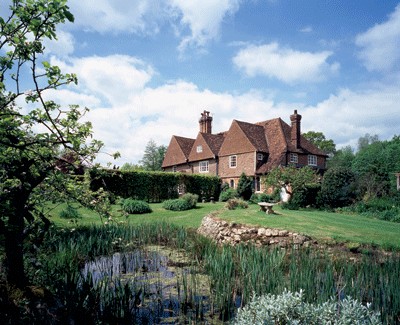 His son, Warham St. Leger, sold it circa 1575 to Thomas Culpeper, who sold it in 1581 to Michael Beresford of Westerham. Source: Hasted, History of Kent, Vol. V, pages 330-331. 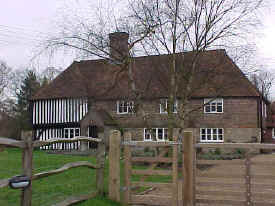 Location: The Chantry no longer stands, but its site is in the middle of Headcorn, at the junction of Grigg Lane and Oak Lane. 1599: Lease on the parsonage and Lordship of Headcorn by St. John’s College, Cambridge to Thomas Culpeper12 of Wigsell in Sussex in which the lessee agrees to pay the annual £5 to the Vicar. The Culpeper arms are over the west doorway (pictured at left) and upon the tomb in the south wall just outside the Lady Chapel (bottom left). The tomb is set under a double-feathered arch with floral ornaments now partially mutilated. 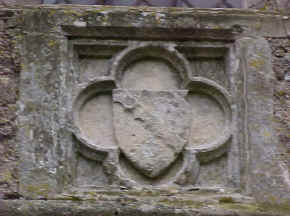 A rich carving of flowers is In the spandrels, and the Culpeper arms are in quartrefoils. Presumably, the otherwise unidentified Culpeper who erected the arms and lies in the tomb is Peter Culpeper8 of Bletchenden. All photographs except that of the tomb by Warren Culpepper, Oct 1999. Location: 9 miles NE of Goudhurst, on the A274. Headcorn, a parish in the hundred of Eyehorne, lathe of Aylesford, county of Kent, 8½ miles SSE from Maidstone, containing 1191 inhabitants. The church, which is dedicated to St. Peter and St. Paul, is principally in the later style of English architecture. Headcorn is a decayed market town, situated on a branch of the river Medway.